Happy Wednesday! The fall weather is just starting to kick in where I live and today’s only supposed to be a high of 58! I’m not a fan of summer and I really hate warm weather, so I’m so excited for it to be cooling down! Since the weather is finally getting cooler, I decided to wear a darker polish today. Today I’m wearing Facets of Fuchsia by Revlon. I’m absolutely in love with this color! Facets of Fuchsia is a black jelly with two different sizes of fuchsia hexagon glitter. I’ve read in some other blogs that this is a dupe for Deborah Lippmann’s Bad Romance, but I don’t personally own Bad Romance, so I can’t say that it is for sure. This applied great and was completely opaque in two coats, but I used three anyway. The only problem I had with this polish was that it was really difficult to clean around the edges of my nails with all of the glitter, which is definitely noticeable in my pictures. This was my first Revlon polish, and I have to say, I'm pretty impressed. I had never really heard much about Revlon's polishes before and just never really considered them until now. When I bought this one, I also picked up Revlon's Starry Pink, so I should have swatches of that one up soon. I purchased this at Target for about $4.75. Anyway, Nice is Nice is a beautiful lavender color. The formula for this one is great, and I had absolutely no problems with it at all. My pictures appear to show some bubbles in the polish, but that was my own mistake with the top coat, and was not the polishes fault. I purchased this polish last Spring, and it is from Essie's French Affair collection. I hope you all had a great weekend! Tonight, I have some swatches of No Means No by Pure Ice to show you all. This is my first Pure Ice polish, and to be honest, I have no idea how long ago I bought this. Possibly two years ago? I know I’ve used this once before, but I have some other colors like this one, so it’s been ages. No Means No is a dark fuchsia color with blue and pink shimmer. This polish applied great and is really opaque. I topped this with Seche Vite and ended up experiencing some shrinkage. The shrinkage was pretty noticeable in my pictures, so I ended up having to do some touch ups in order to photograph my swatches again. I’ve been noticing a lot more Pure Ice polishes in stores lately, and I know they’re pretty cheap, so I definitely could see myself trying some more of them out in the future. I hope you’re all having a fabulous Saturday! I just started an internship on Thursday and have been preparing to move, so I’ve been super busy. I had swatches all ready and was planning on posting on here the past couple of days, but I just couldn’t find the time. Today I have some swatches of Bryant Park by NYC to show you all. 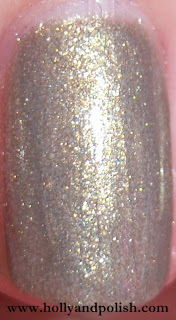 Bryant Park is a browned gold color with shimmer. This applied great but was a little sheer, and I needed 3 coats to reach full opacity. 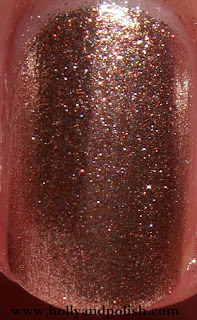 The main negative to this polish is it started chipping the first day I wore it, and I was wearing it with Seche Vite, so I was a little disappointed. I only had to pay $2 for this though, so I can’t be too upset. About a month ago, I ordered all of the stuff I needed to do nail stamping and was really excited to try it out. I’m not that great at nail art, so I figured stamping would be a really great and easy way for me to be creative with my nails. Once I got everything in the mail, I instantly realized that it might not be as easy as I thought it would be and felt a little intimidated. I ended up storing it all away until last night when I finally decided to give it a try. I ended up recycling the manicure I already had on of Zoya’s Jules and stamped Orly’s rage over it using the plate BM-203. I absolutely love these two colors together! I think I did ok for my first stamping attempt. It definitely doesn’t look perfect, and there are some parts of my nails where I didn’t get the stamp on evenly or didn’t push the stamp down onto my entire nail, but I think it could have been much worse. Over time, I'm assuming this will become a lot easier through practice and trail and error. Do those of you who do nail stamping have any tips or tricks that could make learning this any easier? Today I have some swatches of Zoya’s Jules to show you all. I actually received this polish in my Birchbox a couple of months ago, so I just own the smaller size of it (.25 oz), which is half the size of the normal bottle. 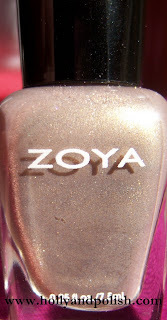 Zoya describes Jules as “A sparkling neutral light taupe with gold, silver and champagne metallic shimmer,” which I think sums this polish up perfectly. I love this color, and I think it's perfect for the fall or winter. This polish is really opaque and applied perfectly. I used two coats. I hope you all have been having a great holiday weekend! My sister and I will be moving in about a week and a half, so I pretty much spent the whole weekend running errands and getting ready. Nothing too exciting. 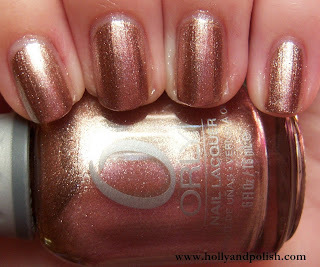 Today, I have some swatches of Orly’s Rage to show you all. Rage is a beautiful rose gold foil. This color is so pretty and is definitely one of my favorite polishes. This applied super smooth and the formula was great! The only negative thing about this polish is that it tends to chip easier than many of my other polishes, so make sure that you wear a good top coat. This was really pigmented, and I probably could have gotten away with only using one coat, but I used two just in case. Pick this up on Amazon! Here's the link!